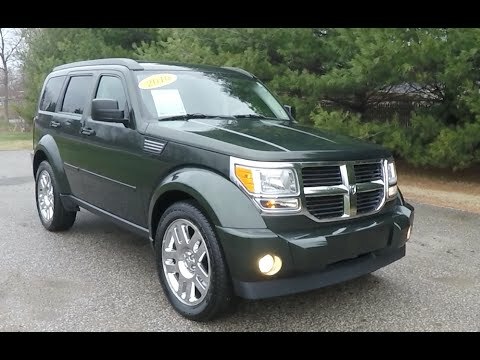 While the 2010 Dodge Nitro derives much of its appeal from its bold exterior styling, it still offers all the versatility of a typical compact/mid-size SUV. Generous rear-seat legroom and a handy slide-out cargo floor help sweeten the deal. Love the size but everything else is a bummer. I LOVE the size of the vehicle! I feel like it's literally the perfect size. I feel like it handles well and it's great in snow. However, it is absolutely terrible on gas mileage. I average between 8 and 11 miles per gallon in town is all. Highway miles per gallon gets up to about 18. Also, there is a piece within the vent control unit that is apparently a well known issue but Dodge doesn't cover the repairs. Mine broke somehow when I closed my door. It broke within my dash and fell down inside. My heat or air will now only come out the top, not the front or the bottom. Apparently the piece costs around $300 to buy and about $1200 for a dealer to repair. Overall, probably wouldn't buy a Dodge again due to the issues and the gas. If I didn't get for the price that I paid for it I would have never bought one. A lot of electrical problems, small doors and interior, really loose steering. Although it does turn on a dime and gets fairly good gas mileage. The back seats have more room then it looks and there are a few features that are really nice, it is small thing like having a small glove box next to the driver side for your insurance information which is really cool. The handling is awkward because the steering is still loose it feels like you drift a lot. I have a lot of weird electrical problems with the car and it is a Dodge so it does burn oil. Chrysler made products are garbage. I have learned my lesson with American made cars too many times, but I keep trying to support our country and buy our products. Until we can start holding ourselves to the same standards of nissan, toyota, honda and subaru, I will not make this mistake again. The car looks great, and is fun to drive. Functionality however is terrible. At 45,000 miles the computer broke and cost me $1,500 to replace- it was recalled on all the years but mine... crooks. At 65,900 miles the transmission failed and had to be rebuilt which was another $4,000. At 80,000 the water pump broke, and I couldn't tell -no lights or alarms- until the serpentine belt fell off- it's attached to the water pump- at which point it had blown a head gasket. I will never buy an American made car again.